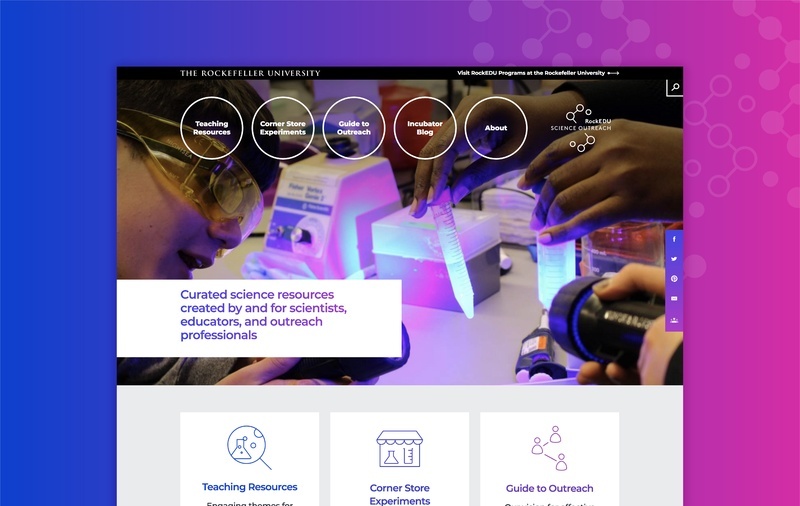 The RockEDU Science Outreach team at Rockefeller University is expanding its outreach, bringing local K-12 students and their teachers together with some of the world’s greatest scientific minds with the launch of RockEDU Online, designed by C&G Partners. For over two decades, RockEDU has offered New York City-based students—often from disadvantaged communities— the opportunity to work side-by-side with the institution’s world-renowned scientists, including past winners of Nobel Prizes in science. RockEDU Online extends this unique learning experience to the world outside of New York, making the program available to learners and teachers globally. Read more about our project in this special article on the site. With social good at the forefront of the project, C&G Partners first conducted focus groups with teachers to understand their true needs, and then opted for a “cool but simple” flexible structure and brand identity. The design had to be engaging but not dumbed down, and suitable for multiple audiences with wide-ranging levels of experiences and skills, including teachers, students, scientists, and outreach professionals. The color scheme and iconography are all derived from scientific notation, including a bright and fluorescent gamma often present in lab experiments. From hot pink to electric blue, we chose bold and vibrant colors aimed at youth, colors that traditional science education has avoided. The website plays up the ‘geek factor’ of the scientific environment, but also makes sure the site is engaging and easily usable to people of any age. 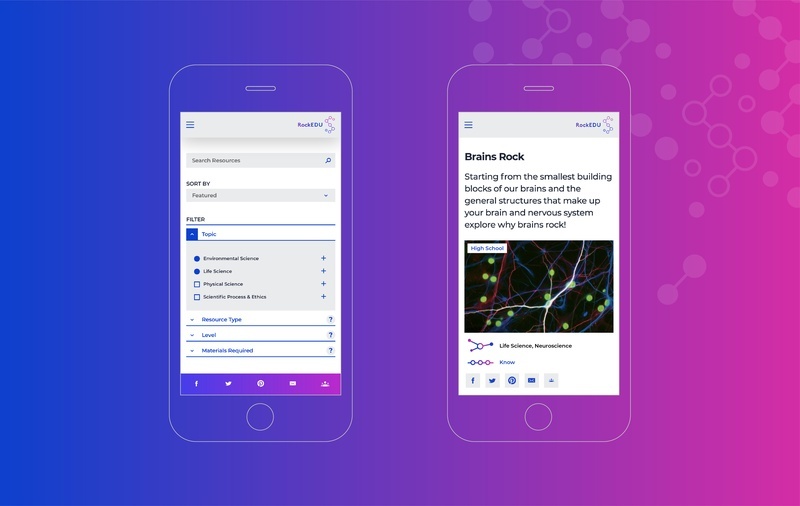 The site was designed to help scientists create exciting scientific experiences that are tailored to the minds of students. It also enables teachers to discover creative science experiences for their classes and provides students with ways to explore science using only supplies found at a local corner store. The central challenge of site design was to craft a structure that teachers could easily browse, find content applicable to their setting, and open doors to extensive and customizable material.This was achieved through a centralized “Teaching Resource Center” with carefully crafted filters and searches to enable teachers to find resources that fit their precise needs. The customized content structure allows teachers to dig into the areas of the content that interests them, and then download documents, save them to Google Drive, or share them on Google Classroom. 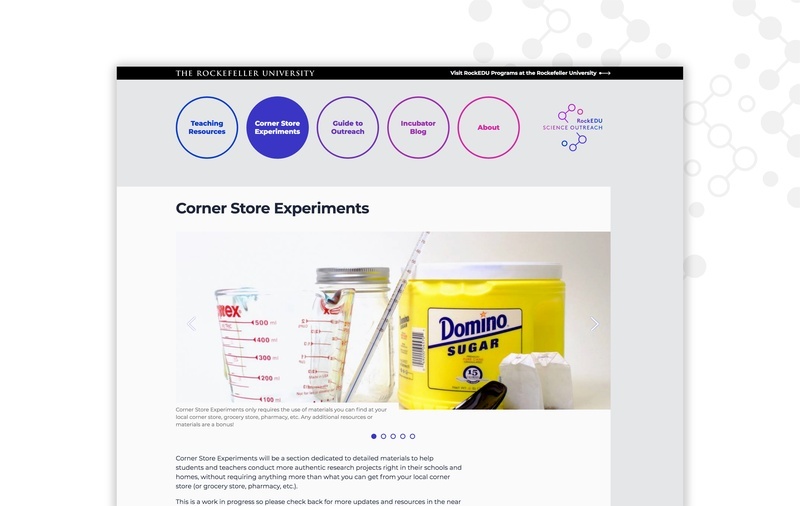 RockEDU Online allows teachers in underprivileged areas to bring fresh perspectives and scientific ideas to their classrooms, connect their students with one of the best research institutions in the world, and hopefully inspire the great scientific minds of tomorrow. C&G Partners has worked on a number of design projects for the University including a print communication suite, university website, and award-winning annual report.